If you want a man who’s streamlined, sharp and serious – then Kev Lucas isn’t the guy for you but his photographs certainly are. Whilst the world of sports photography might suggest someone needs to be as disciplined as its subjects or as fierce – Kev certainly doesn’t take himself that seriously. He’s a mad surfer; lover of all sports and his business attire involves “fancier boardies” than the ones he’s meeting me in today. Kev has been the man behind the lens of the Avon Descent and Aussies in Action Sports Photography for the last 16 years and as the countdown to the event draws closer, we sit sipping coffee and take a walk down memory lane of an event very near and dear to his heart. It was back in 2000 that the first digital camera – the Nikon D1- came out and made sports photography possible. The body alone was $12,500 – not including any lenses – and was a 2.75-megapixel camera (your average iPhone is about 8 megapixels). The memory cards for the money shots were an astronomical $485 each for 96 megabytes. Kev and his wife Wendy were the first business in WA to take advantage of the Nikon D1 and went on to set up their home business around photographing sporting events – in which they have been very successful. Kev laughs as he recalls setting up at his first Avon Descent in 2001 at Sids Rapids; he was standing in the water up to his knees, shooting as the paddlers and powerboats came by, whilst Wendy who was tucked up on the riverbank, was processing the shots as Kev took them, on her laptop being powered by a generator attached to their Ford Ranger. Things are a little different now; often with a team of 6 or 7 photographers set up at the best viewpoints of the Avon – some of the cameras allow Kev to wifi the images straight to the team in the caravan (that’s taken to their big events) to process them. In 2008 when the water was at its highest level in 20 years, Kev decided to compete in a single kayak. 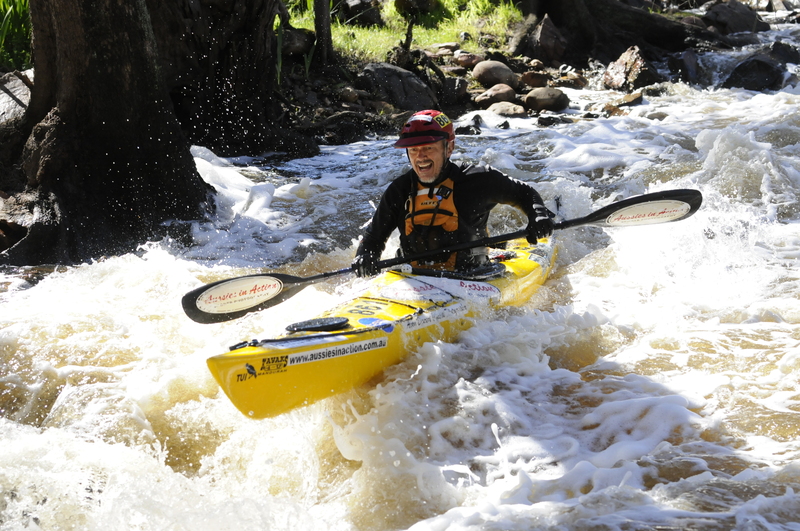 Having never paddled in whitewater before, he admits to being a bit scared in a few moments – especially as 197 competitors had pulled out prior to the start of the event thanks to the water level. He came off at Supershoot but that one dunk into the river was the only time he came out – surprising himself as he made his way through Sid’s Rapids. As he made his way to the finish line, running up onto shore – he wondered where his photographer (who had been stationed there all day) had gone? Turns out to have a toilet break, so there is no photographic evidence of Kev’s achievement. We both laugh at the irony. The water level of the Avon has come to be quite notorious in the last 10 years – with the organisation having to add “Hell or Highwater” to the event title given some horrifically dry past years. While one might not consider the water to be a photographers concern, for Kev it is a numbers game; the fewer competitors, the fewer photographs. Aussies in Action shoot the Avon Descent each year free of charge. This comes from both a personal and professional appreciation of the event and more than anything, a love of the community that the event creates. In Kev’s own words; “there’s bugger all money in it – if we worked out the hours it’d be something like $5 an hour we get for it. But it’s enjoyable.” There’s no denying that technology has also proved to be a challenge for them; with a considerable uptake of “Weekend Warriors” or amateur photographers taking advantage of the competition for a little something on the side. Not to mention the fact that everyone carries a camera around in their pocket – and a smart phone is a convenience that is difficult to compete with. But the Avon Descent is part of Kev’s history; home to family and good friends; big laughs and bright memories. Kev’s been there to witness power boats barrel rolling, double kayaks going down Sid’s Rapids backwards and the hairier side of the Avon – when competitors have been pinned by powerboats and kayaks sea-sawing on obtruding rocks. He’s seen wipeouts in whitewater and whirlpool madness. But his favourite moment of the Avon? “At the Northam Weir at the start, when you get the paddlers come up and then hit the ramp – it’s just this log jam and we’re looking at it with a 600mm lens and you can see that it’s just this – the lens compresses it – it’s this big jam and I’ve been there and it’s dangerous – people get clipped in the head by paddles but you can see all the faces and it’s just a magic vision of those and all those faces.. It’s just a crazy introduction”. When I ask him why he shoots the Avon his answer is “to tell the story”. His photographs are about the journey that a competitor takes from the moment they first get onto the water to that last triumphant one when they step out. It’s about capturing their struggle, determination and ultimately – hopefully – their joy when they have achieved the magnificent feat that is the Avon Descent. Lastly, I challenge him to sum it all up in one word – to which he laughs, pauses for a moment and then says “Epic”. Epic indeed. With a man who truly cares about the event and the community involved in it, I’d say that the 2017 Avon Descent – like the 16 before it – is in pretty good hands… Can’t say the same about the boardie standards though. Aussies in Action provide a package of all your digital images (between 20 and 40) from start to finish in high resolution for $135.